Background Data modeling for electronic health records (EHRs) is complex, requiring technological and cognitive sophistication. The openEHR approach leverages the tacit knowledge of domain experts made explicit in a model development process aiming at interoperability and data reuse. Objective The purpose of our research was to explore the process that enabled the aggregation of the tacit knowledge of domain experts in an explicit form using the Clinical Knowledge Manager (CKM) platform and associated assets. The Tobacco Smoking Summary archetype is used to illustrate this. Methods Three methods were used to triangulate findings: (1) observation of CKM discussions by crowdsourced domain experts in two reviews, (2) observation of editor discussions and decision-making, and (3) interviews with eight domain experts. CKM discussions were analyzed for content and editor discussions for decision-making, and interviews were thematically analyzed to explore in depth the explication of tacit knowledge. 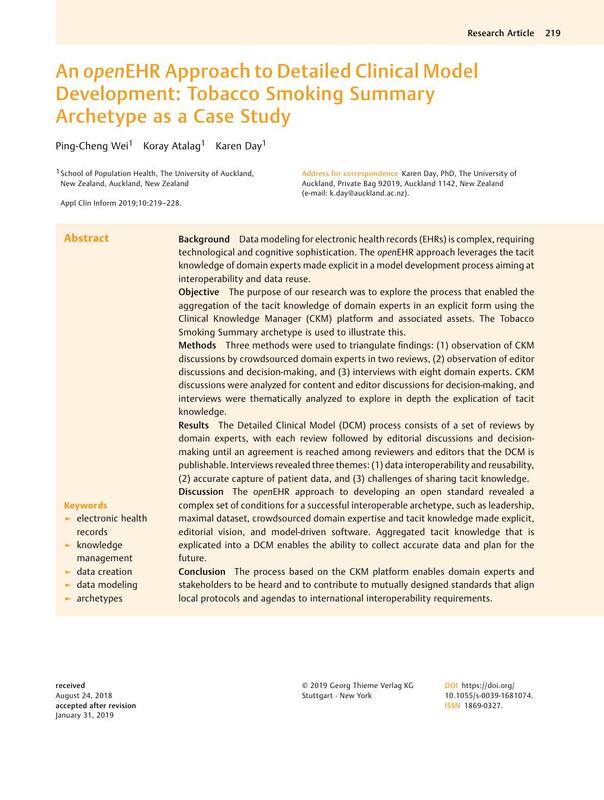 Results The Detailed Clinical Model (DCM) process consists of a set of reviews by domain experts, with each review followed by editorial discussions and decision-making until an agreement is reached among reviewers and editors that the DCM is publishable. Interviews revealed three themes: (1) data interoperability and reusability, (2) accurate capture of patient data, and (3) challenges of sharing tacit knowledge. Discussion The openEHR approach to developing an open standard revealed a complex set of conditions for a successful interoperable archetype, such as leadership, maximal dataset, crowdsourced domain expertise and tacit knowledge made explicit, editorial vision, and model-driven software. Aggregated tacit knowledge that is explicated into a DCM enables the ability to collect accurate data and plan for the future. Conclusion The process based on the CKM platform enables domain experts and stakeholders to be heard and to contribute to mutually designed standards that align local protocols and agendas to international interoperability requirements. This study has satisfied the ethical considerations of research required by the University of Auckland Human Participation Ethics Committee and was approved on August 19, 2016, for 3 years (reference number: 017360).